Yes, indeed, I'm joining another challenge. This one is just too good and perhaps too important not to support. This challenge is hosted by Aarti, Care, and Eva, but it was born on Twitter! 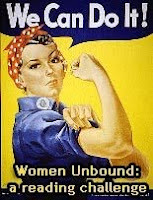 See the Women Unbound Challenge blog for all the details and credits. Here's the idea in a nutshell: pick a level of commitment (which includes both fiction and nonfiction) and read books related to women's issues. The definition is broad enough that everyone should be able to participate. I'm going for the suffragette level, which requires that I read eight books, including at least three nonfiction, between November 1, 2009, and November 30, 2010. I'm going to try to stick with books I already own, but I may deviate. Fortunately, we are not required to produce a reading list. I know that my nonfiction will likely be biographies and much of the fiction will be historical fiction. I read my fair share of feminist books in the 1970s and 1980s, and I'm looking forward to seeing the reviews by participants who are reading those books for the first time. Don't be shy, think about joining in. You go girl!!! This one looks terrific! This is right up your alley! Have fun with it. Hmmm...now I'm starting to feel left out! I have to stay strong, as we all know what January 1st is like! Yeah! Another reader joined up :) Here's my reading list for the challenge. Glad you're joining. Happy reading. This sounds like a wonderful challenge. I'm still debating whether to join in. I am so eager about this challenge and am now thinking of finding more books to read than the two I've picked out for joining at the lowest level. Can't wait to see what you will end up reading - hoping to get inspired. I keep wandering into book blogging circles and getting all excited by the reading challenges everyone posts about and being tempted to do them myself - this one particularly appeals! But I won't, because I'll just get irritated with myself for not following through ;-) I will, however, enjoy reading your reviews especially the historical fiction ones. I'm thinking on doing this one. It does sound interesting! I'm going to join this one too. I haven't finalized my level yet. I was thinking about re-reading some of the old standards like Feminine Mystique to see what it looks like a few decades later. I'll be interested in following your list and reviews. I don't do reading challenges but I will watch your take on this one with interest. I've always had an interest in the suffragettes so maybe I'll pick up a hint or two of some interesting books to read - especially historical fiction. Thanks for bringing this back to my attention...Velvet did a few days ago and now with your post I'm definitely in! I haven't signed up for this one yet, but I'm thinking about it. I'm afraid of over-challenge syndrome, since I never really did any before very recently (other than the 999 Challenge which I mostly ignored and finished by accident). I've joined this one as well!